* If you want to prepare your own panel, start with unprimed Hardbord and seal it and apply your own oil or acrylic primers. * Hardbord is the finest pressed wood panel available anywhere. * Made in the U. * from quality hardwoods, this panel resists warping and moisture penetration. 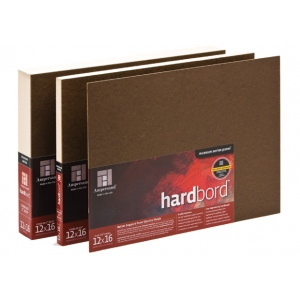 * Hardbord accepts all types of commercial and handmade gesso grounds. * Complete priming instructions inside product labeling. * Available 1/8" flat, 1/4" flat, cradled with 3/4" strips or with the new 2" DEEP cradle. * Hardbord is also an excellent surface onto which paper can be mounted.